RAK Oakington August 1943 with their new Stirling EF465 MG-D.
All but the Flight Engineer and M/UG were Kiwis. The large tiki has a motto which is indistinct. Note the 1940's style photo shop. 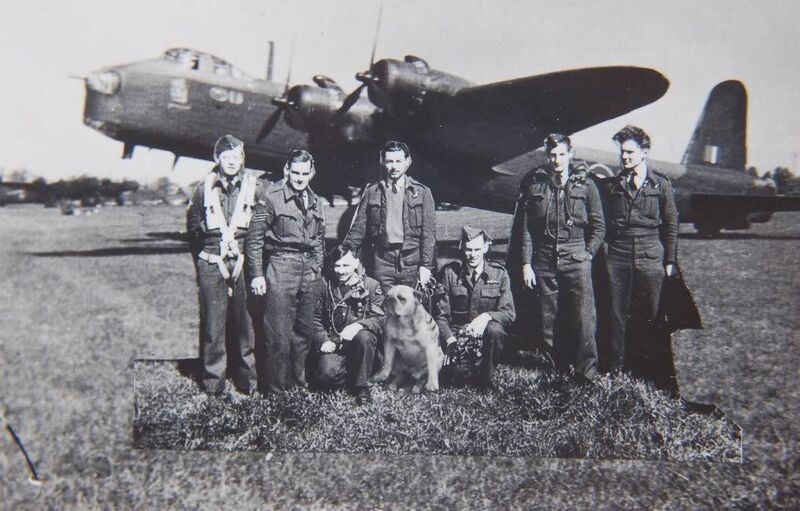 The Bulldog mascot of 7 Squadron was famous for petrol tin bunting. Skipper Ben Dallenger with the Tiki Stirling. All the crew were killed on the night of 17/9/42 on a raid to Essen, part of 17 New Zealanders killed that night on a large scale raid which drew on Wellingtons from Operational Training Units. This crew was on its 5th Operation together. Graham Burgess was the original skipper of this crew but had been hospitalised with pluresey and eventually was shipped home to recover. In remembrance of Sgt Edgar Harvey who died in December 1942 with the rest of the crew. I reckon the motto below the tiki is "Te Kooti"? 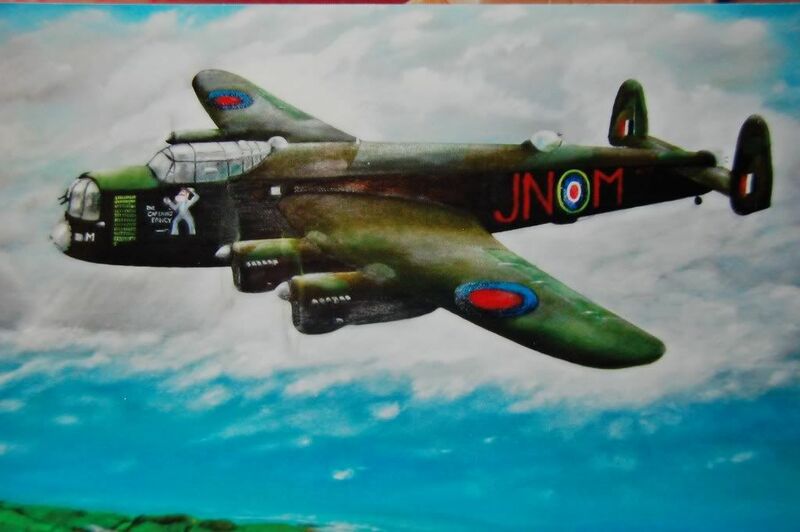 By the way Dee, Doug told me just the other day that his 75 Lancaster HK601, JN Dog had a piece of nose-art! A (Disney) Pluto-look-alike apparently - first I knew! Dee , I will have to check back to the original collection. Red face here Dee, I joined two unrelated stories. Enlaging the Tiki Stirling photo shows AA-J clearly in the background so it is likely a 75 machine. Ben Dallenger took over from Graham Burgess as pilot on 7 squadron when he contracted pleuresy and was eventually repatriated to NZ. 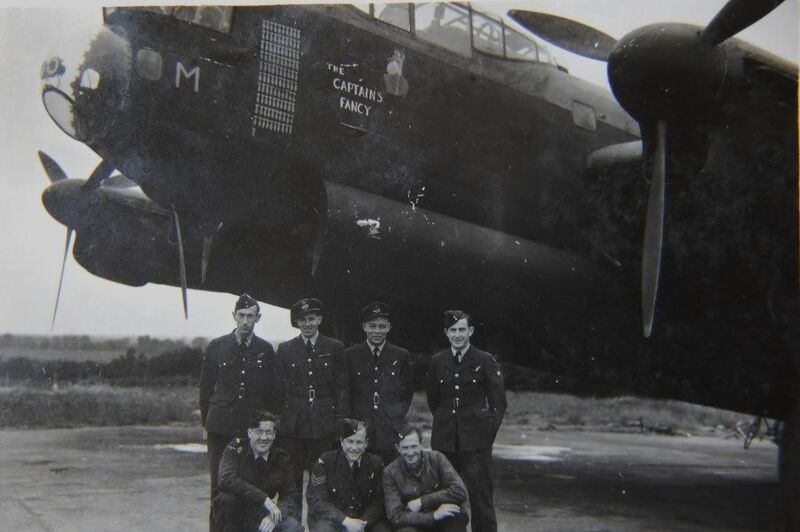 As Errols book records Ben and is crew were lost on 17/9/42 in W7569 MG-D of 7 squadron. Regarding the Tiki Stirling do you have a serial number. The Tiki photos and others were given to Graham Burgess by Lady Sylvia Lamb who had lived in Sark, but moved prior to the Germans arriving.She or her family had connections to Browns Hotel in Westland and offered Kiwis a break in her home in England. Many gave her photos , mostly un named and this is where the original came from. 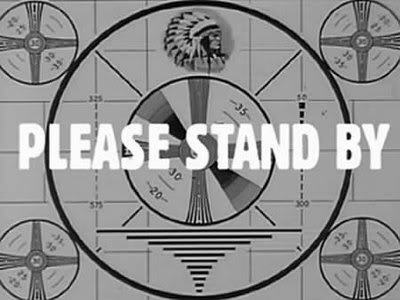 So I shall now go to the blackboard and right 100 times ...check and recheck before posting !!! So who flew the Tiki Stirling.? 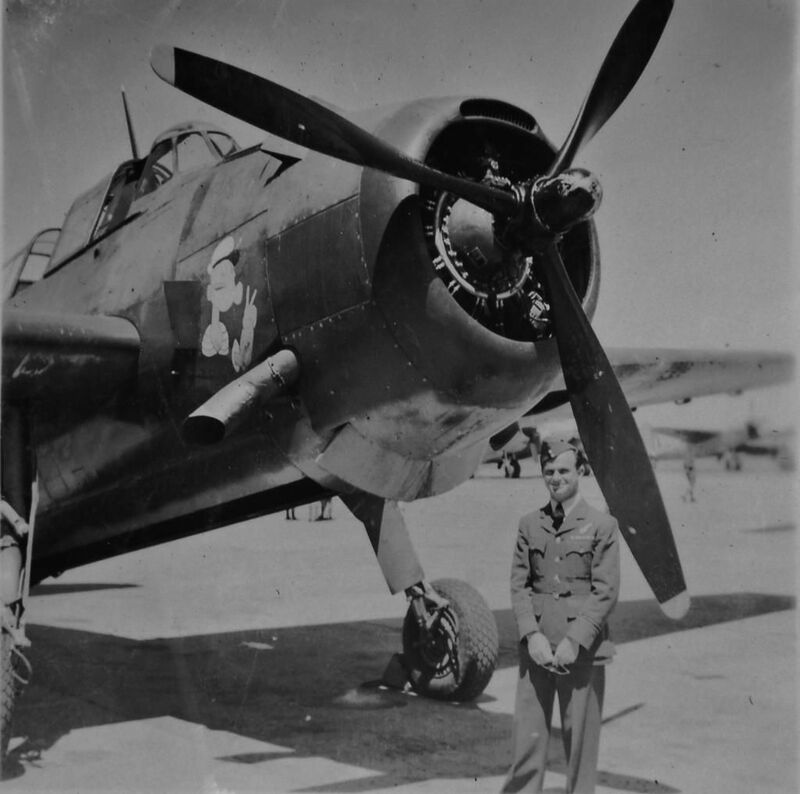 A new photo of the Avenger at Ohakea in the 1940's. Posing is Mac Morgan still wearing his wartime observers badge. He later retrained as a pilot and instructor. Super shot! Is that a Mosquito in the background? Yes it is Dave, Mac served on 75 Sq in its Mossie era. I thought so. He was also on No. 489 (NZ) Squadron. Although this thread is for wartime aircraft wearing nose art I reckon it's worth adding some postwar RNZAF nose art and nicknames here too. From the AHSNZ Journal 4 Dec 1967. Not the best picture but you can see the name MATAATUA (no space) above, and just forward of, the crew door in black plus a picture of NZ on the tail. Interesting to see that name on the Canberra, thanks. 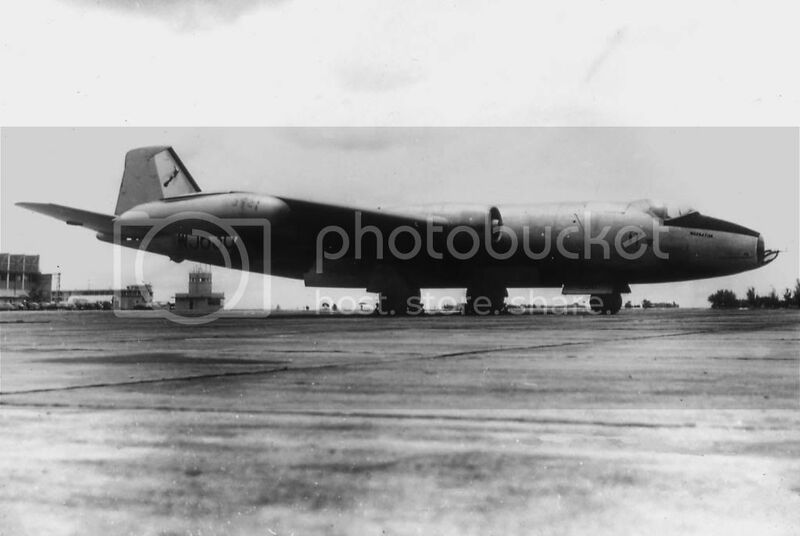 I never realised too till I read the AHSNZ article that the NZ map and red kiwi emblem as seen here was later replaced with a green tiki, has anyone got a close up of that emblem on a Canberra tail? Here's another I found just now, thanks to NZ Wings from July 1980. In that famous often seen photo of three No. 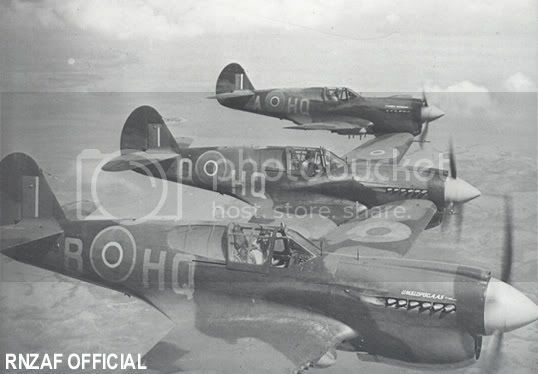 14 Squadron 'B' Flight P-40E's sidling up to Leo White's camera lens (he was in a Harvard) the closest to camera HQ-B (NZ3008)flown by probably Stan Quill is well known as UMSLOGOGAAS. What an awesome name. 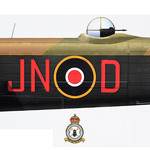 As that aircraft still resides at Masterton, I wonder if we could convince Mr Slade to repaint it in its original scheme with original nickname! 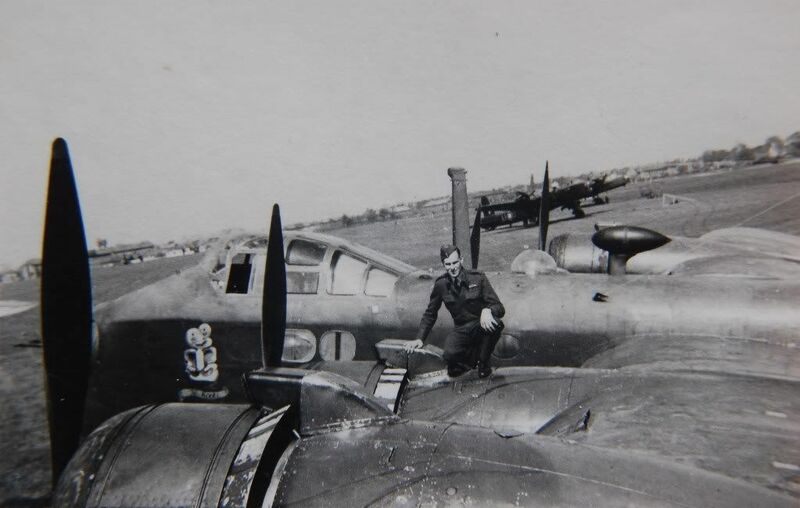 SIR, I draw your attention to the photograph on page 23 of the July copy of WINGS in which you speculate that I may have been the pilot of P40 NZ3008. The answer is no: I believe that it was (then) Flt. Lt. J.A. Oldfield — it certainly looks like him! However NZ3008 was the aeroplane I frequently flew and that rather odd name Umslopogaas was indeed the one I gave it. Many have asked how such a name came about. The following extract from the book "Allan Quartermain" by H. Rider Haggard will indicate I hope that it was a name of some relevance. ". . . .and now behold, Umslopogaas, I knew thee for a great warrior and a brave man faithful to the death. Even in Zululand where all men are brave they called thee the "Slaughterer" and at night told stories round the fires of thy strength and deeds. . . "
Well done in finding that William. I hadn't seen this till now! NZ3036 up close. His name was Stan Quill, not Quilt. So far (to my surprise) no one has mentioned the RNZAF Catalina (serial un-recalled) which did the 'mail run' up to Hong Kong immediately after hostilities ended (although the aircraft was still in combat configuration) The aircraft's 'voyage' was detailed in the book on New Zealand flying-boats published several years ago, and during this operation it was (from memory) given the nickname 'China Mailman' and had its 'nose art'applied, this art being of a cartoon character inspired by an American candy bar. It is usually recognized as being the aircraft that undertook the last RNZAF combat patrol of WW2. Perhaps someone can find and post a photograph? A question for the researchers. Many years ago I owned an RNZAF-official 3/4 low nose (port side) aspect photo of a PV-1 which had been taken at Ohakea. The aircraft featured an extremely irate Donald Duck (decal?) placed to the right of the rear-fuselage access door. The a/c serial number is, regrettably, not known. Unfortunately I loaned the photo to a member of the IPMS and it never came back. 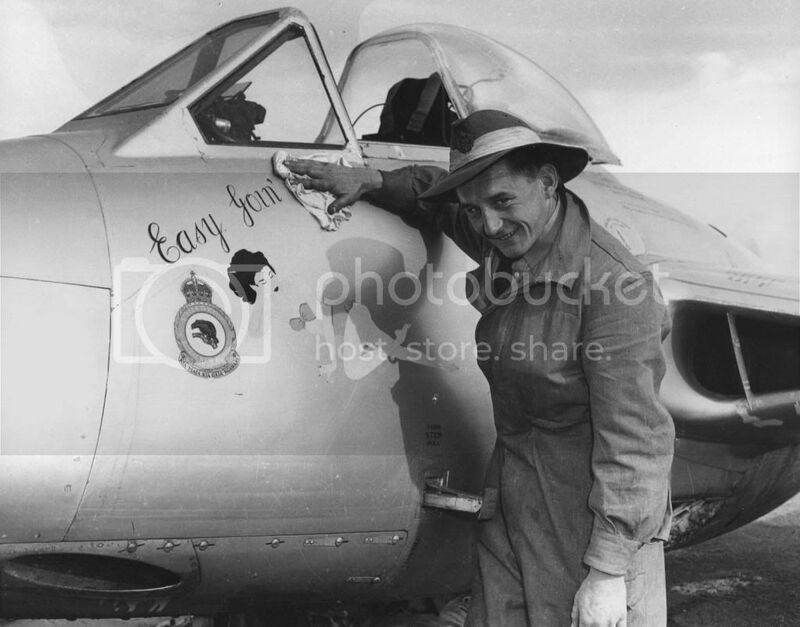 However, as it was an RNZAF official pic. can anyone advise if it is possible to obtain a copy of this, and, if so, from what section of the RNZAF? Wigram museum perhaps? There were loads of RNZAF Venturas with Donald Duck (and other Disney characters) on them in that position. Esmond Ware Skipper of 75 Squadrons C Flight JN-M (NE181) at Mepal showing 101 ops in April 1945. Both Esmonde and Colin Emslie survived and are active today. That is my Dad Stan Heald he is at back left not front right. Very exiting to find him here. I have his log book so can track all the planes he flew in.